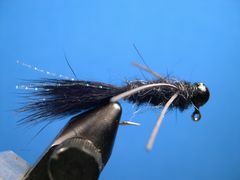 The Micro-Jig can be one of the most effective flies in your fly box. Tie it and try it. You will be surprised how effective it can be on everything from bluegills to carp. 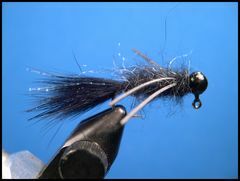 Tie the Micro-Jig in any color and size that suits you. I prefer to use a 1/80th oz. Jig Head. My favorite colors are Black, White, and Chartreuse. The recipe calls for Rainbow Thread which is a thinner version of Crystal Flash. I prefer it over Crystal Flash, but Crystal Flash will work just fine. Wapsi Fly offers Ball Style Jig Heads with a gold hook and a dull lead head in sizes 1/8,1/16,1/64,1/80, and 1/124 oz. I prefer the middle sizes (1/80 oz. and 1/64 oz.). The 1/80 oz. jig head has a size 10 hook and the 1/64 oz. has a size 8 hook. There are a lot of variations of this little guy. For instance, I sometimes put white legs on a black body or black legs on a white body or black legs on a chartreuse body. 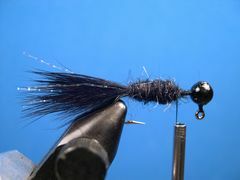 You can also add a soft hackle collar if you like. 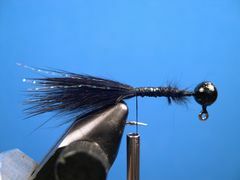 Even though the head of the fly in the tying sequence has been painted black (this particular jig had a silver head and hook) I prefer the Wapsi Jig Heads with the gold hook and the dull lead head. 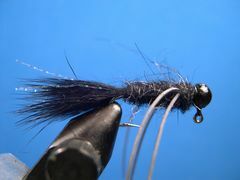 The recipe calls for Hare-Tron Dubbin which is a blend of antron fibers and rabbit fur. 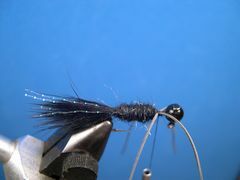 It's easy to dub and it really gives the fly a buggy look when it's brushed with a dubbing brush. There are a couple of ways to fish the Micro-Jig. One is to fish it in and around rocks and weeds with short strips which impart an up and down (jigging) action. The other is to fish it in heavy cover (brush piles and sunken trees) under a strike indicator (bobber). 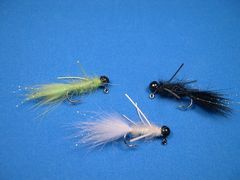 Either way, fish it on a fairly light tippet. If you're fishing it properly, in and around cover, you're going to frequently loose the fly and the fly is a lot easier to break off with a light tippet. Fishing the Micro-Jig under a strike indicator can be deadly for fish like Crappies that are holding in drowned trees and brush. Simply attach a strike indicator a foot or so above the fly and let it sit in the strike zone over the cover. Some would call it "bobber" fishing and that's probably true. But it sure is effective. Insert the Jig Hook in the vice, crimp the barb, and start the thread at the head. 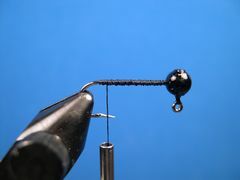 Lay down a thread base from the front of the hook to the hook's bend. 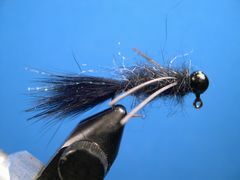 Tie in a couple of strands of Rainbow Thread or Crystal Flash on each side of the tail. Dub a body with Hare-Tron Dubbin to the two-thirds point on the hook. Tie in a two-inch long piece of rubber legging material for the legs on the far side and the near side of the hook's shank. 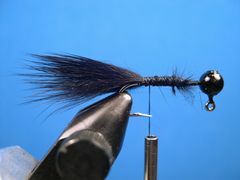 After the legs have been attached, apply more dubbing to the standing thread and dub behind the legs, between the legs, and in front of them, up to the head of the fly. Tie off the thread with a couple of half-hitches or a whip finish behind the lead head. Trim the rubber legs to a length that suits you. I like them to be between one-half and three-quarters of an inch long. 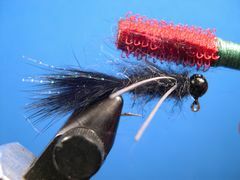 Lightly brush the dubbed body with your dubbing brush to give the body a "buggier" look. If you are not familiar with the velcro dubbing brush click on "Dubbing Brush" to find out how to make one. Your Micro-Jig is ready to fish.